Match colors to advance the color run! Race your friends for the fastest time in this original arcade classic. We wanted to build a hardware hack with materials we had on hand. Our goal was to build a arcade style game that is easy to learn but hard to master. 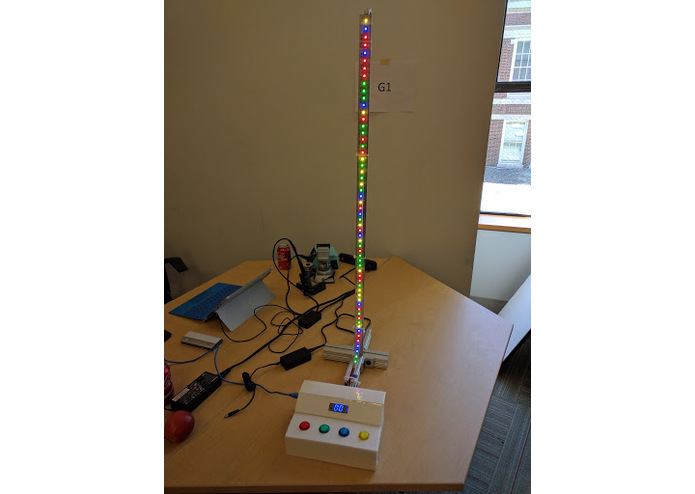 This resulted in a RGB LED color strip race game assembled and coded entirely at the hackathon. The goal is to clear the run as fast as possible. To advance the run, press the button that matches the first LED on the rainbow strip. Be careful! An incorrect color will set you back in the run! When you reach the end of the run, check your time, if the clock is blinking you have set a new High Score. Try all 4 levels to set your best times! Internally the game runs on an Arduino Mega, coded in ArduinoC. We control the clock display and LED strip via digital buses on the Arduino. The buttons are interfaced directly with digital logic so that we can use hardware interrupts for accurate game play. Our enclosure is a prototype we built out of foam core board for the hackathon. We have plans to take it apart and laser cut each piece out of acrylic for a finished product. We encountered issues with buttons registering twice during the game. We thought it was a debouncing issue with our interrupts but an oscilloscope proved that the issue was more complex. We spent several hours diagnosing this issue and determined that the hardware interrupt configuration was to blame. Projects can take longer than expected, but watching them come to life is worth the effort.